Experience the excitement of seeing the city of Asheville, NC from a bird’s-eye view on a rooftop bar tour with us! 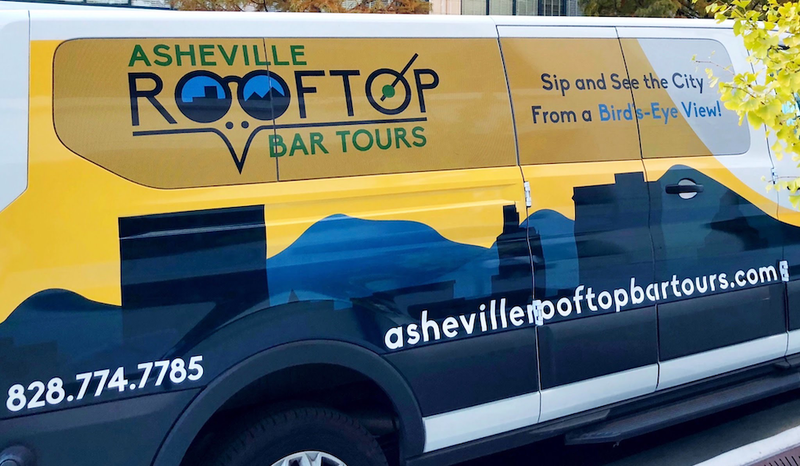 At Asheville Rooftop Bar Tours, we’ve created tours that are a one of a kind blend of city history and sightseeing, with award winning rooftop bars and rooftop restaurants included in the mix. Enjoy the view as our experienced rooftop bar and restaurant tour guides share with you the wonders of this vibrant city that visitors have flocked to since the 1800’s. 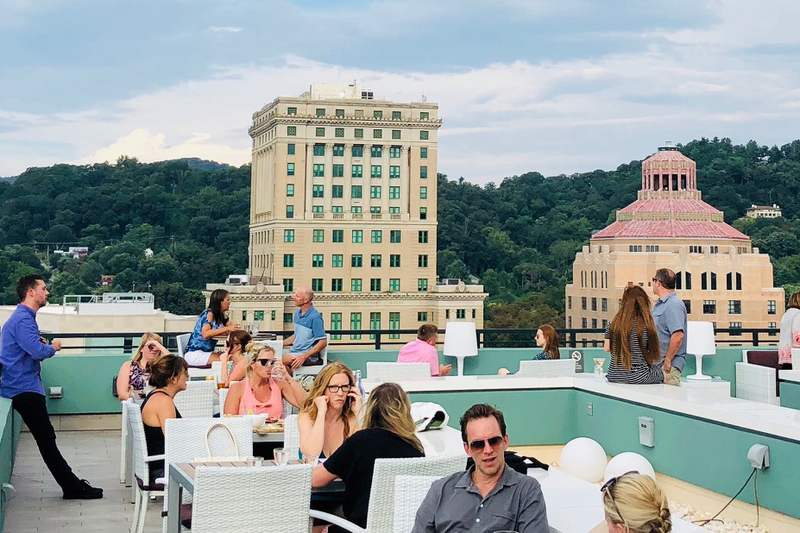 From a 1920’s skyscraper with terraced balconies, to a sleek and modern rooftop bar in the middle of the thriving city of Asheville….Asheville Rooftop Bar Tours takes you there! 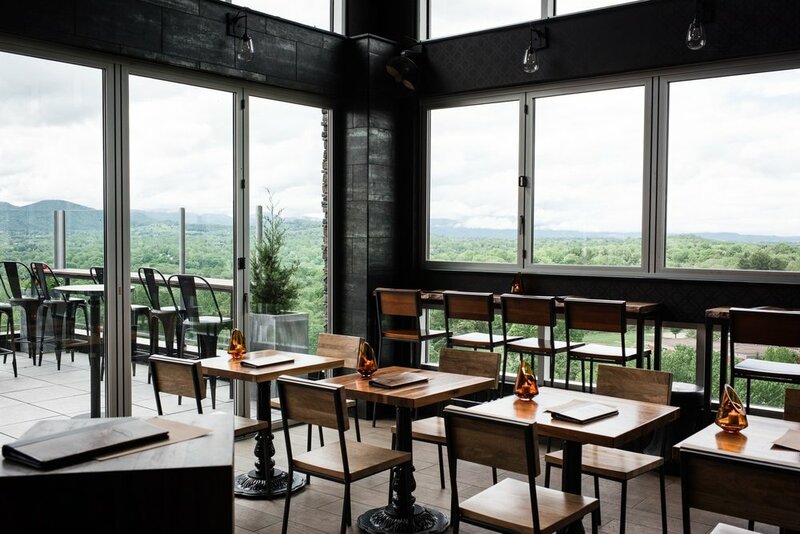 Tap into our staff’s extensive knowledge of the local area on places to eat and drink, fun things to do, and things not to be missed in Asheville and in the surrounding area. Ride in the comfort of our climate controlled 10 passenger van as our driver navigates the busy city streets with ease. 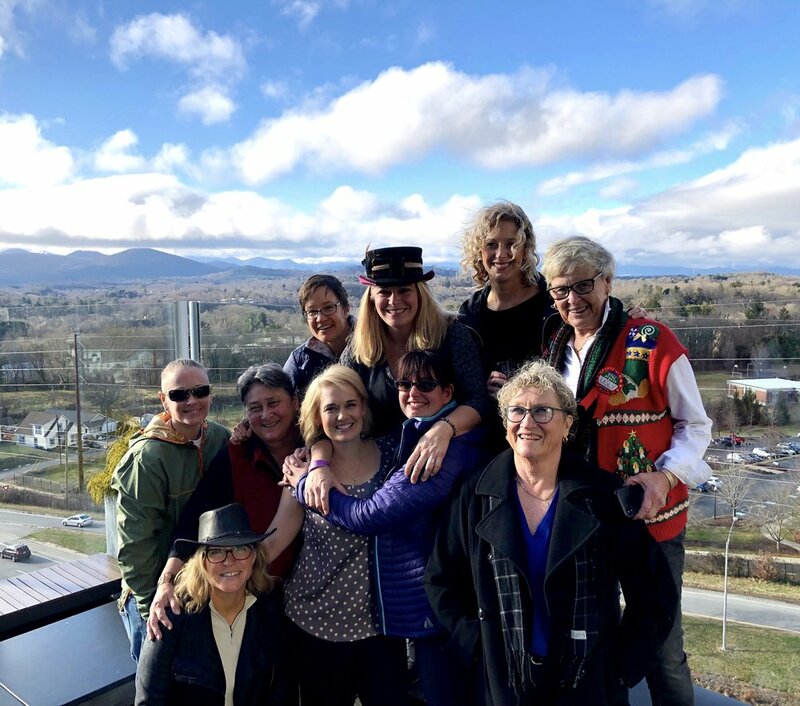 Asheville Rooftop Bar Tours values our partnerships with the rooftop bars, hotels and rooftop restaurants that our tours visit. Our tour guests love the welcome they receive from our rooftop partners at each stop on our tours. We are excited and proud to be the first company to share our beautiful city that we love so much from the rooftops with you! Book today for a memorable one of a kind rooftop experience! Our tours are a fun and relaxing way to see the city of Asheville, NC. One of the best parts: a driver! At Asheville Rooftop Bar Tours, you can count on us to give you the down low on the up high! Asheville, long considered the “ Land of the Sky”, is nestled in the beautiful Blue Ridge Mountains of Western North Carolina along the Great Smoky Mountains. Pick the day that works best for you when you book. Exact rooftop bars on each tour differ depending on your tour day. Must be 21 years old and older to take this tour. Enjoy perks offered only for our rooftop bar tour guests! No need to go hungry while on the tour! Receive these great food discounts from our wonderful rooftop partners. Pillar Rooftop Bar- 25% off, Capella on 9- 20% off, Wxyz- 15% off. (discounts for food only). Is Wxyz on the tour you've selected? Return with our ARBT/Wxyz coupon after your tour to Wxyz to enjoy a free four flight of beer courtesy of Wxyz Lounge. The Rooftop Tour-Tini.... The best price on this refreshing signature cocktail for Asheville Rooftop Bar Tours created by and offered exclusively at Pillar Rooftop Bar. The Bird’s-Eye View…. A reasonably priced and deliciously crafted signature cocktail from Wxyz made exclusively for Asheville Rooftop Bar Tours with locally created and distilled, Chemist Gin. Each tour guest must sign a waiver of liability during the secure checkout process. If you'd like to review it before booking, you can do so here. Starting location for each tour is in the center of the city. Exact location with street address will be sent in a confirmation email once tour is booked. 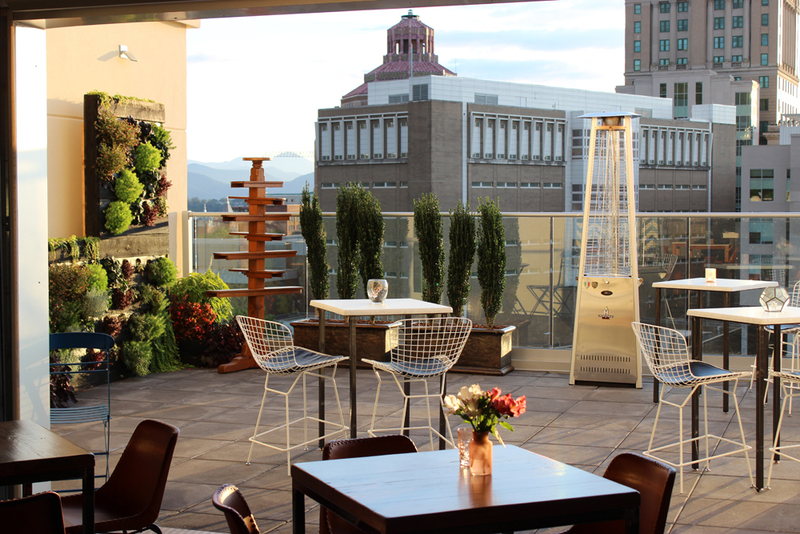 Asheville Rooftop Bar Tours is excited to introduce you to the following rooftop bars that share the sky in this beautiful city. Won’t you let us take you there? A craft cocktail bar in the heart of downtown Asheville, also serving small plates in a unique rooftop patio setting. The Social Lounge is part of a renovated late Victorian building completed in the 1880’s when the railroad first came to Asheville. It attracts tourists and is also a favorite among locals. 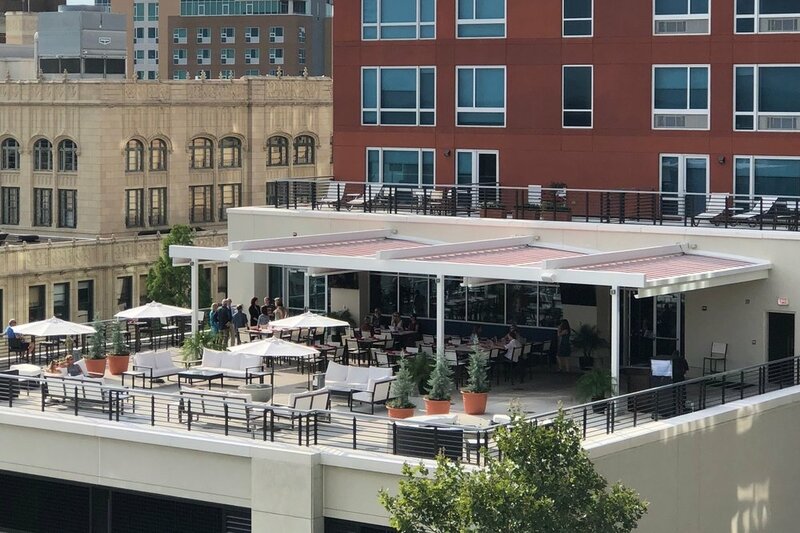 The Montford is an innovative rooftop bar focusing on Asheville brews, craft cocktails, unique wine and local ingredients. The Historic Flatiron Building. World Coffee Cafe’s SkyBAR. It all began here! This award winning rooftop bar continues to wow visitors from far and near. The SkyBAR is situated on multi level terraced balconies on the 6th, 7th, and 8th floors of one the most iconic buildings in the city, a 1920’s Skyscraper! Panoramic views. Classically crafted cocktails. Voted “Best Drink With a View” 2017 by Mountain Xpress’s Best of WNC. Capella on 9, “Voted 50 best rooftop bars in the world” by US News and World Report. It boasts "head turning views" and brings a sleek, modern feel to the city skies. A big city look, with an intimate, small city feel. Capella serves handcrafted cocktails and more, along with locally curated dishes. Small plates, big views….locally sourced and crafted with care. Wxyz Lounge at ALOFT Hotel. The Ledge is an impressive veranda overlooking Biltmore Avenue in the heart of the city. A trendy bar with mixologists in the know! Mountain Xpress 2018: Voted Best Hotel Bar, 2nd place. ALOFT hotel was awarded the Reader's Choice Award by USA Today for Pet Friendliest Hotel. Pillar Rooftop Bar is located in the heart of downtown Asheville featuring local brews, hand-crafted cocktails and spectacular views of the Blue Ridge Mountains. Try a “Creative License” cocktail and have our bartenders make an innovative drink to fit to your tastes. Home of the Asheville Rooftop Bar Tours signature cocktail: The Rooftop Tour-Tini. Contact Us! We will set up the perfect rooftop experience for your group. Birthdays • Bridal Showers • Customer Appreciation • Bachelorette Parties • Team Building • Family Reunions • Employee Appreciation • Retirement • And more! If you have any questions, feel free to give us a call or send us a message below! Is this a "drinking tour"? Asheville Rooftop Bar Tours is excited to introduce you to the city from a unique rooftop perspective with some history added to the mix. Drinking while riding in our company vans isn’t permitted as you are being transported from one rooftop location to the next. If you choose to indulge in one or more of the incredible handcrafted cocktails, delicious locally brewed beers, and extensive wine lists that the rooftop establishments offer, we kindly ask that you please drink responsibly. What is the age you must be to go on one of the tours? Tours are for guests 21 years of age and older. How do I purchase tickets for a rooftop bar tour? After reading the descriptions of the tours offered, simply click on the "BOOK NOW" button to securely book your tour. Do I have to climb stairs while on one of the tours? Yes, there is only one rooftop bar location that requires climbing steps (Social Lounge). The building is from the late 1800’s. There are 10-12 steps to reach the rooftop area. Each tour takes 2.5 hours or 3.5 hours, depending on tour selected. All tours will have a starting location in the heart of the city of Asheville, NC. After booking your tour, an email confirmation will be sent to you that will include the location and street address for the starting point of your tour. Please arrive no later than 10 minutes before scheduled start of tour to allow for check-in and to receive your wrist band to wear while on the tour. At end of tour, guests will be transported by company van back to the original start location of your tour. Do I have to sign a waiver of liability before going on a tour? Yes, each guest on an Asheville Rooftop Bar Tour must sign a waiver of liability. This can be done electronically during the secure online booking process. Will the tours be cancelled because of rain? Tours will be held rain or shine. We have umbrellas and ponchos available, if needed. Many of the rooftop establishments we visit have covered outdoor areas as well as open air areas. We understand that some visitors may only be in town for a short period of time and still want to have this rooftop experience even if there happens to be some liquid sunshine that day! We will, however, follow the lead of the rooftop bar locations we visit and keep you up to date on their individual inclement (bad) weather policies and adjust our tours accordingly. Can I bring my dog on the tour with me? We love dogs, but unfortunately we are not set up to accommodate you bringing your pet. What if I have to cancel the ticket I purchased? For regular tours of groups of 5 or more, you must cancel 3 days in advance to receive a full refund. If your group is 4 or less or individually purchased, you must cancel at least 24 hours prior to the scheduled tour time to receive a full refund. If canceling your ticket within 24 hours of scheduled tour time, no refunds will be given. Do you offer special group tours/rates? Yes! Contact us for more information. Some examples of groups we love to work with include businesses interested in a team-building experience, celebrating life events such as birthdays and weddings, and excursions for retirement communities. Is it appropriate to give a gratuity to the tour guide and to the van driver?